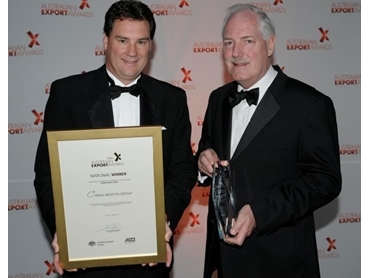 Federal Minister for Trade, Simon Crean, announced Craig Mostyn Group (CMG) as national winner of the prestigious Agribusiness Category in the Australian Export Awards last Friday at the National Gallery of Victoria. The award for demonstrating outstanding marketing innovation and commitment to international business caps a remarkable run for the Fremantle, WA, head-quartered food, agribusiness and logistics company, which services more than 60 countries. CMG was recently inducted into the WA Industry and Export Awards Hall of Fame, having won the WA Agribusiness Export Award for the third successive year. This year CMG has also won the inaugural Food Industry Association of WA Environment and Sustainability Award and PPC Linley Valley Fresh, owned by CMG, won the Hong Kong Australia Business Association 2008 Business Award, Exporting of Goods Category. Accredited with AQIS, AUSMeat, HACCP and NASAA, PPC/LVF exports fresh pork to Singapore, New Zealand, Thailand, China, Hong Kong, Korea and USA. PPC/LVF is a very significant exporter of pork into Asia, with about 20 per cent of Australian pork exports into the Asian region and 50 per cent of Australia's fresh, chilled pork into Singapore coming from PPC's Establishment 618. Speaking at the National Awards Presentation, Mr Crean said the Australian Export Awards recognise the outstanding achievements of individual Australian enterprises and highlight that the prosperity and employment prospects of all Australians increasingly rely on the country’s ability to successfully engage international markets. “Australian Export Award category winners are excellent examples of internationally competitive Australian enterprises helping drive our trade performance. “Last year these 13 companies competed and won on the world stage, earning $969 million in export revenue and employing more than 1400 Australians,” Mr Crean said. Now in its 46th year, the Australian Export Awards program is co-presented by Austrade and the Australian Chamber of Commerce and Industry.